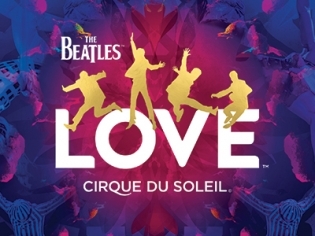 he Beatles LOVE by Cirque du Soleil celebrates one of the most beloved music groups of our times! The show is action, packed, and filled with gravity-defying stunts, and stellar visuals. Don't miss out on this exclusive offer for The Beatles LOVE at Mirage. Save up to $72 off per ticket when you book online. See the Beatles LOVE at Mirage with this special offer. Save up to $86 per ticket with combo packages and more! Discounts on almost all seat categories with this offer. Get your tickets now for 2019 performances of The Beatles LOVE at Mirage. Rates from $79/ticket before taxes and fees when you book online. Fueled by almost 30 of the Beatles’ most iconic hits, LOVE takes audiences on a journey through the history of one of rock ‘n’ roll’s most influential bands with stunning acrobatics and psychedelic imagery. 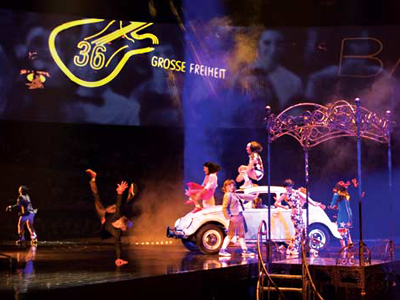 LOVE is a psychedelic rock ‘n’ roll spectacle that features stunning acrobatics and scenes set to the soundtrack of the Beatles. 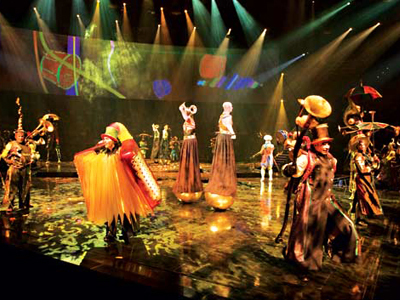 The show began as a collaboration between Cirque Du Soleil and ex-Beatle George Harrison. After his death, friends and family members worked to finish the project with their creative input to help bring Harrison’s vision to life. The setting for LOVE is against the backdrop of the psychedelic 60’s era of rock ‘n’ roll and politics. As is the case in any typical Cirque show, stories are told through high-flying acrobatic performances that feature supremely detailed choreography and dazzling costumes. Each era and hit Beatles song features accompanying costumes and themes to bring the music of this legendary band to new heights. 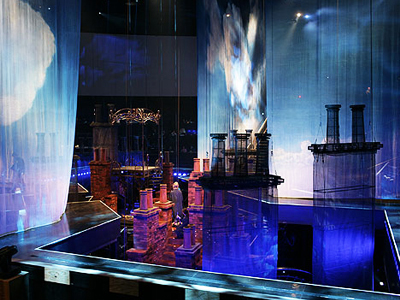 The LOVE theater features 360-degree seating with incredible views from any angle and distance. 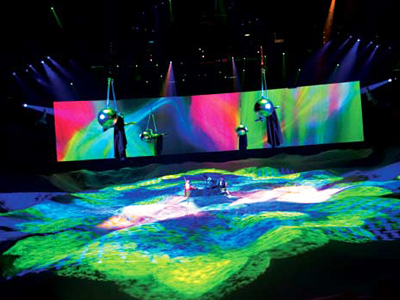 There are projectors and jumbo screens that display images and add to the technical awe of this brilliant show. If you are a Beatles fan, this is an absolute must-see show for the next time you are in Las Vegas. This is such a fun show to see. Make sure you sit closer to the first row, because there is some amazing interaction. The performers are so talented and the show flowed very well! I wanna go again! If you ever liked the Beatles, you will not be disappointed by seeing this show! The music was spot on and so were the performers. A perk is that all seats in the theater are good. No matter where you sit you’ll enjoy it. I highly recommend this show, it’s a must see. What an Entertaining show, as if the Great Classic music of the Beatles isn’t amusing enough, the shear talent of the artists is remarkable. I loved every minute of this show and sang along the entire time! Very captivating! So amazing. Starts and goes so quickly, even though its 90 mins you enjoy your time so much it feels like a 30 min show. The kind of how you leave wanting to buy tickets to the next showing. There is so much to watch you can’t catch everything. I’m a huge Beatles fan, but even if you aren’t, this show is amazing. One of the best cirque shows there is! The music and acrobatics are incredible and there’s something for everyone to love!! Excellent. I’m not much of a Beattles fan but this show brought me back to see it three times!!! This is THE best show I’ve been to. I am completely addicted. 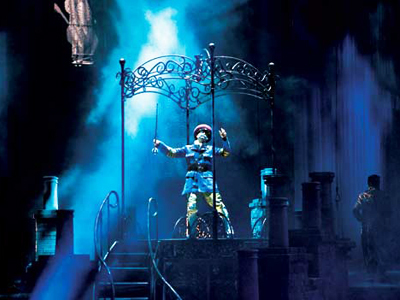 The music, lights, acrobatics, the incense they pump into the seating elements, incredible! I can’t wait to go back. Beatles fans wanted What a great way to remember the Beatles. The show is a must see.. should be #1 in Vegas not 16! Whether you are a huge Beatles fan or not, this show is wonderful. The theater is smaller, so there isnt a bad seat in the house. The show was amazing. The music, the costumes. There werent as many acrobats as other Cirque shows, but it didnt feel lacking with them. We had a marvelous time!